JCK’s July issue cover shoot highlights our “best in show” choices from the JCK show in Las Vegas. And yes, we shot them on a dog. You can see the whole issue here. 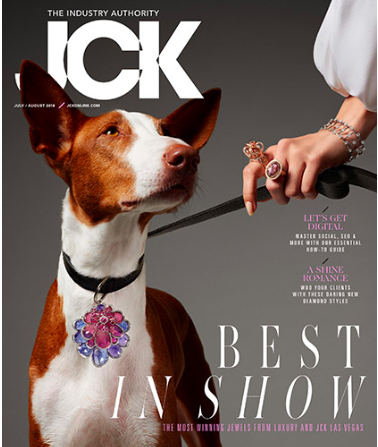 Our cover star, Magnolia, is an Ibizan hound and is wearing a pendant by Vivaan, and her handler is sporting rings by Dallas Prince Designs and Omi Prive, as well as a Rahaminov diamond bracelet. Photo by Stephen Lewis.